ABSTRACT: There is a great need for low-cost intelligent biochips capable of massive parallel detection to be used in portable instrumentation. Electrochemical methods are inherently low-cost, miniaturisable and easily integrated into multiplexed systems for the parallel screening of a panel of biomarkers. Of particular interest are biologically sensitive field-effect transistors (BioFETs) and impedance-based sensors. We here exemplify the use of synthetic molecules such as DNA aptamers and peptide aptamers (Affimers), as alternatives to antibodies, as well as oligonucleotide-based approaches in impedance and BioFET sensors for the detection of a range of biomarkers in medical diagnosis and for environmental monitoring. 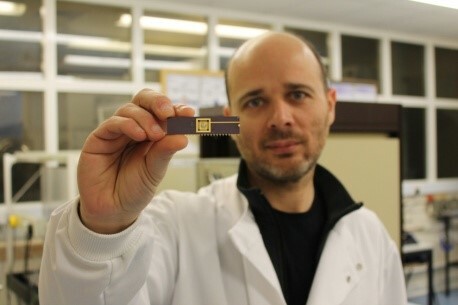 Biography: Pedro Estrela is a Senior Lecturer and Director of Research at the Department of Electronic & Electrical Engineering at the University of Bath. He has a background in Physics (degree and Masters from the University of Lisbon, PhD from the University of Amsterdam) and started working in the field of biosensors in 2000 as a (Senior) Research Associate at the University of Cambridge, before joining the University of Bath in 2008. Dr Estrela’s research focuses on the development of label-free electrical, electrochemical and optoelectronic biosensors for a wide range of applications such as medical diagnostics and environmental monitoring. He is the manager of the Bath Biosensor Network, Theme Leader (Healthcare Technologies) at the Centre for Sustainable Chemical Technologies, Theme Leader (Sensors & Data) at the Water Innovation & Research Centre, Coordinator of the Marie Curie Initial Training Network PROSENSE (2012-2016) devoted to prostate cancer diagnosis.